Annette and Craig Brassard opened Freedom MAIL Center January 6, 2003 because they had a vision of giving people the Freedom in mailing that wasn’t being offered. After working for the United States Postal Service for 22 years, Annette Broussard discovered that the public had a need for services that could not be provided through the Post Office system. With a desire to do what she loved, without the constraints of working for the Postal Service, and the mindset of “do what you know,” this gave birth to an idea. Give the public exactly what they had been waiting for… a mail service center that would offer Freedom to its customers. 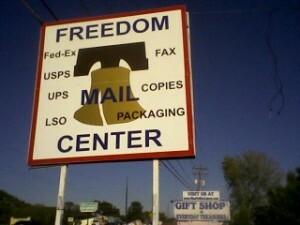 Freedom MAIL Center gives people what they need and makes it a convenience, not a hassle. Experience and knowledge are key factors at Freedom MAIL Center, but with the personal touch and friendly service they are known for.